The aluminum panels are extremely durable and impact resistant. The quality finish will last for years. The cover mounts inside of the bed rails for a very sleek look. A flush two-panel design enhances the style of your truck. Lightweight panels make it easy to open and close the cover. The contents of your bed are safe and secure when the tailgate is locked. If you are looking for a unique cover then the Evo tonneau cover by Gator is for you. This heavy duty aluminum truck bed cover with keep your product protected and from prying eyes. Gator Evo is a bi-fold hard cover that will do everything that a normal are tri fold can do but in half the time to open it. 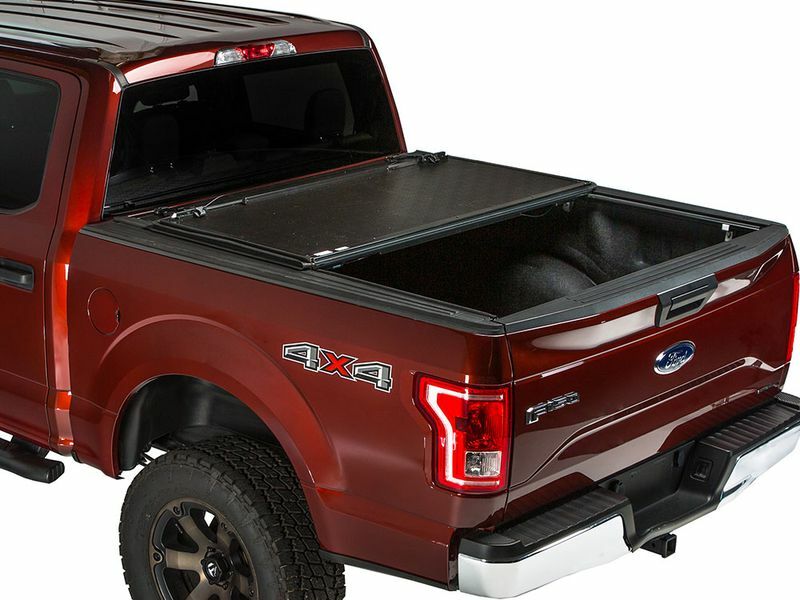 This cover will look great on your truck and is one of the only bi-fold covers on the market but that's not all it also comes with a kick stand so that you can get in to the back of your bed to access the rest of your cargo. Easy to install, this Gator Evo tonneau cover will only take you about 30 minutes to install. It uses clamp on rails so no special tool are required. This truck bed cover is very low profile because it sits inside of the bed rails, once the bed rails are install there will be no more use of tools. The folding section can be removed without any tools, that way if you want to use the whole bed it only takes you a few minutes to take off your cover. Built in America, your Gator Evo tonneau cover will come with a three year warranty. This bi-fold cover is very easy to use and is perfect for you. So order yours today! Installing a hard cover can be quite a pain in the neck. Not so with the Evo! Gator uses clamp-on rails to make mounting your new bed cover quick and painless. Each cover will come with detailed instructions but you can always call us for questions or more information.